The BTTLNS Anti blisters-chafing stick 60g Epione 1.0 guarantees optimal comfort by preventing abrasions, blisters or a chapped skin! This 100% natural formula is invisible, waterproof, dry, non-greasy and very easy to apply. 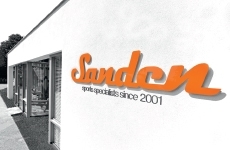 Ideal for swimmers, runners, cyclists, skiers, walkers, all water sports, endurance and athletes. BTTLNS Epione 1.0 tolerates neoprene and does not stain clothing and is widely used to prevent skin problems due to extreme cold or wet conditions. 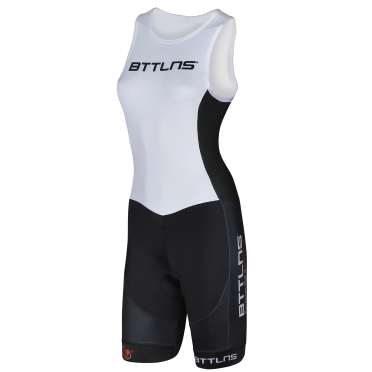 The BTTLNS Goddess ITU trisuit sleeveless white Nemesis 1.0 is designed with a half YKK zipper on the back and according to ITU rules. BTTLNS has developed this ladies trisuit with a CRE-UTR racing fabric on the front and a highly breathable MESH3D-EP on the back. In addition, this trisuit has a special treatment to minimalize the absorption of water, to make it super fast during the swim. The ITU suit is equipped with HydroSpeed ​​bags and an Italian women Tri-lite chamois, to achieve maximum speed and excellent comfort during long distances. The BTTLNS Gods ITU trisuit sleeveless white Nemesis 1.0 is designed with a half YKK zipper on the back and according to ITU rules. BTTLNS has developed this trisuit with a CRE-UTR racing fabric on the front and a highly breathable MESH3D-EP on the back. In addition, this trisuit has a special treatment to minimalize the absorption of water, to make it super fast during the swim. The ITU suit is equipped with HydroSpeed ​​bags and an Italian Tri-lite chamois, to achieve maximum speed and excellent comfort during long distances. 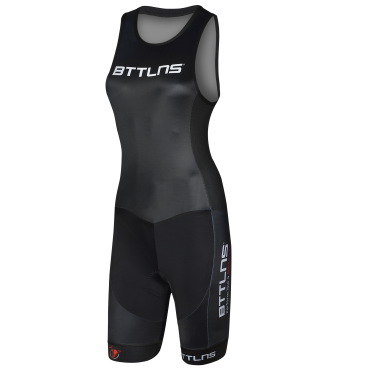 The BTTLNS Goddess ITU trisuit sleeveless black Nemesis 1.0 is designed with a half YKK zipper on the back and according to ITU rules. BTTLNS has developed this ladies trisuit with a CRE-UTR racing fabric on the front and a highly breathable MESH3D-EP on the back. In addition, this trisuit has a special treatment to minimalize the absorption of water, to make it super fast during the swim. The ITU suit is equipped with HydroSpeed ​​bags and an Italian women Tri-lite chamois, to achieve maximum speed and excellent comfort during long distances. 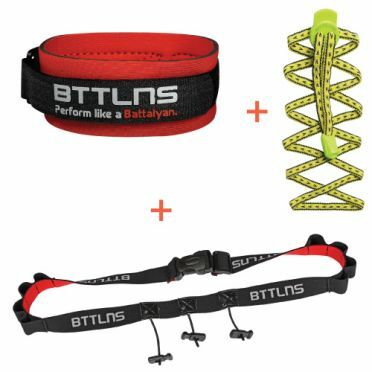 This BTTLNS Triathlon accessories discount package yellow ensures that you have all three necessary triathlon accessories needed to start a triathlon! 3 accessories that you as a triathlete can't miss when going to perform a triathlon competition. 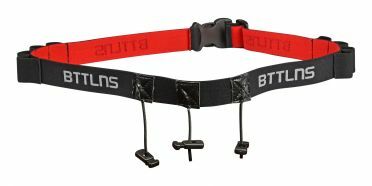 This discount package consists of a BTTLNS Race number belt, BTTLNS chipband and BTTLNS reflection quick lock laces reflective black. 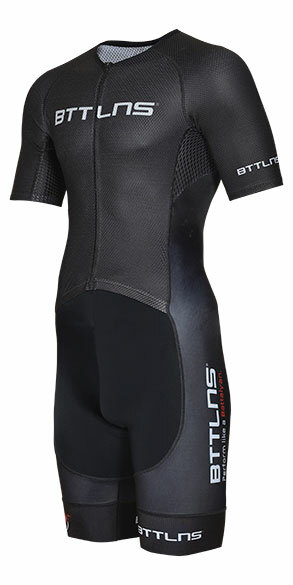 The BTTLNS Gods ITU trisuit sleeveless black Nemesis 1.0 is designed with a half YKK zipper on the back and according to ITU rules. BTTLNS has developed this trisuit with a CRE-UTR racing fabric on the front and a highly breathable MESH3D-EP on the back. In addition, this trisuit has a special treatment to minimalize the absorption of water, to make it super fast during the swim. The ITU suit is equipped with HydroSpeed ​​bags and an Italian Tri-lite chamois, to achieve maximum speed and excellent comfort during long distances. 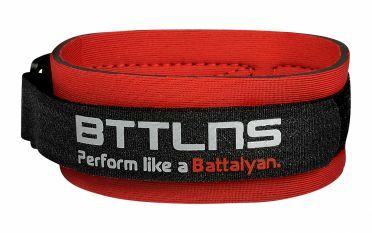 Completely renewed within the range of BTTLNS, the BTTLNS Race number belt Keeper 2.0. This Race number belt has experienced several improvements to increase wearing comfort durability. Specially developed High-Stretch material ensures increased elasticity and the flat buckle provides a very comfortable connection. Equipped with six energy gel loops to take sufficient nutrition with you during the last part of the triathlon. 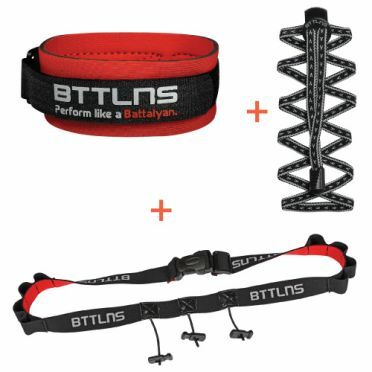 This BTTLNS Triathlon accessories discount package black ensures that you have all three necessary triathlon accessories needed to start a triathlon! 3 accessories that you as a triathlete can't miss when going to perform a triathlon competition. This discount package consists of a BTTLNS Race number belt, BTTLNS chipband and BTTLNS reflection quick lock laces reflective black. Use these BTTLNS Quick lock laces reflectiv yellow Momentum 1.0 when you want the fastest transition possible! How much convenience, simplicity and speed do you wish? You don't want to tie your shoelaces at the transition? Very durable ultra-grip quick laces with a limited stretch to give extra stability to your running shoes. Developed with reflection for maximum visibility and safety! Ideal for triathletes, hikers, runners, children and the elderly. Delivery consists of two quick laces, quick release and pull-holder. Use these BTTLNS Quick lock laces reflectiv black Momentum 1.0 when you want the fastest transition possible! 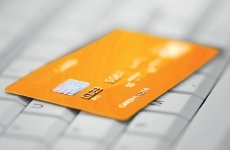 How much convenience, simplicity and speed do you wish? You don't want to tie your shoelaces at the transition? Very durable ultra-grip quick laces with a limited stretch to give extra stability to your running shoes. Developed with reflection for maximum visibility and safety! Ideal for triathletes, hikers, runners, children and the elderly. Delivery consists of two quick laces, quick release and pull-holder. 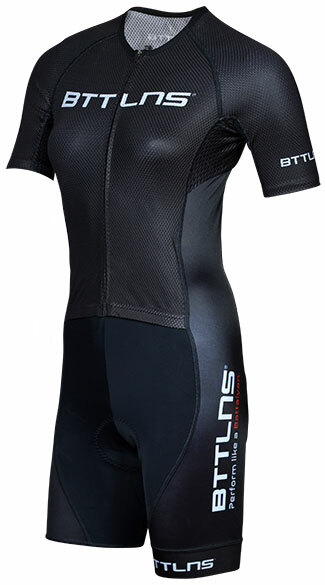 The BTTLNS Goddess trisuit short sleeve Typhon 1.0 is well known by his perfect combination of a excellent breathability with a dynamic panel design. The Typhon 1.0 features a special coating, this TRI coating avoids the absorption of water and ensures maximum performance. Maximum comfort is possible by a women specific Tri-lite chamois that ensures enough support during the cycling part but prevents irritation during the swim and run. Flat lock stitches, BTTLNS art elastic leg grippers, Speed mesh panels and 2 HydroAero pockets ensures maximum comfort and excellent performance during your triathlon. The BTTLNS Gods trisuit short sleeve Typhon 1.0 is well known by his perfect combination of a excellent breathability with a dynamic panel design. The Typhon 1.0 features a special coating, this TRI coating avoids the absorption of water and ensures maximum performance. Maximum comfort is possible by a Italian Tri-lite chamois that ensures enough support during the cycling part but prevents irritation during the swim and run. Flat lock stitches, BTTLNS art elastic leg grippers, Speed mesh panels and 2 HydroAero pockets ensures maximum comfort and excellent performance during your triathlon. 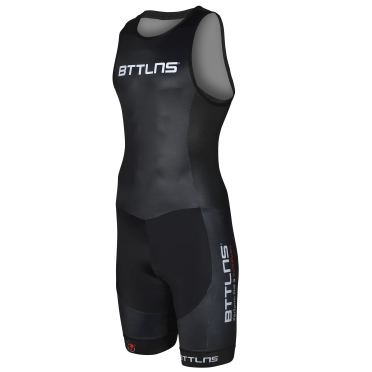 The BTTLNS Gods trisuit sleeveless Rapine 1.0 is well known by his perfect combination of a excellent breathability with a dynamic panel design. The Rapine 1.0 features a special coating, this TRI coating avoids the absorption of water and ensures maximum performance. Maximum comfort is possible by a Tri-lite chamois that ensures enough support during the cycling part but prevents irritation during the swim and run. Flat lock stitches, BTTLNS art elastic leg grippers, Speed mesh panels and 2 HydroAero pockets ensures maximum comfort and excellent performance during your triathlon.